In the 21st century, it’s hard to remember how popular Westerns were on U.S. television. At their height, Westerns had their own category in the Emmys. The one Western that stood above the others was Gunsmoke, which had a 20-year run on CBS. 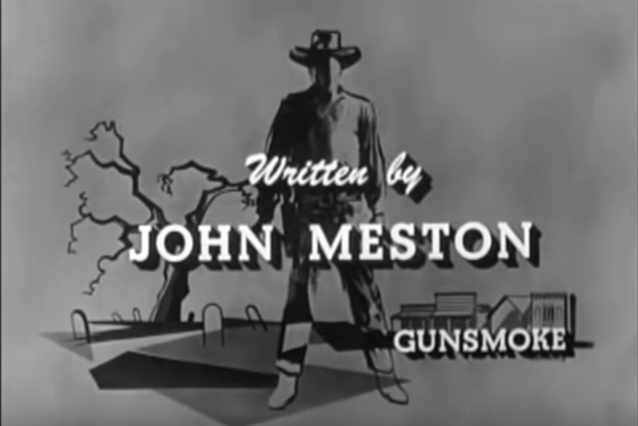 And one of the show’s key figures was writer John Meston, who co-created the Gunsmoke radio show in 1952. Meston’s radio scripts were initially adapted for television. In those early days, they’d often they’d be assigned to other writers, including future movie director Sam Peckinpah. By the show’s second season, Norman Macdonnell, Gunsmoke’s other co-creator was now in the producer’s chair. Meston was writing full television scripts, either adapting his radio work or penning new stories. Meston would be the primary writer for the TV show’s first 10 seasons, even outlasting Macdonnell, who was replaced as producer during the 10th season. Meston’s scripts included Bloody Hands, a 1957 installment in which Matt Dillon (James Arness) almost falls apart after killing three of four bank robbers in self defense. Tired of the bloodshed, Dillon quits his U.S. marshal job. For a brief while, Dillon enjoys his respite. He beats Doc (Milburn Stone) in a game of checkers and goes fishing with Kitty (Amanda Blake). But Dillon, in the end, can’t escape. A gunman has killed one of saloon women at the Long Branch. Chester (Dennis Weaver) rides to the stream where Dillon and Kitty are relaxing. Chester, uncharacteristically is wearing a gun belt. He hands it to Dillon. No one else is capable of taking the gun man. “I would if I could, but I ain’t good enough,” Chester says. Dillon attempts to protest. An emotional Chkester replies “it too late for that, Mr. Dillon. Just way too late.” Dillon takes the gun belt. The episode ends with Dillon riding back to Dodge City. Dillon has been dragged back into the life he thought he could escape from. Admittedly, this post has nothing do with spies. However, I was watching a 1964 Meston-scripted Gunsmoke on Monday night (Dry Well). Like a lot of Meston stories, it ends less than happily with a trafic and unnecessary death. “What a waste,” says Burt Reynolds’ Quint Asper, a Meston-created character introduced in the early 1960s. As a result, I tweeted out an image of the Meston title card shown in this post. That tweet got more of a response than I expected. 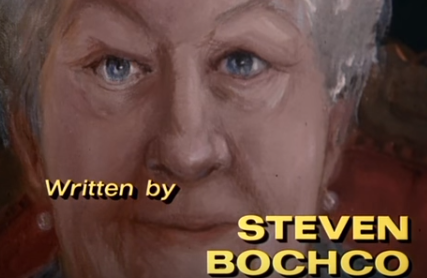 So I figured Meston definitely merited an entry in the blog’s “unsung figures of television” series. Meston died in 1979 at the age of 64. The New York Times published a four-paragraph obituary published by the United Press International news service. One of the prolific and talented writers on television ended his life as a footnote in the newspaper of record. 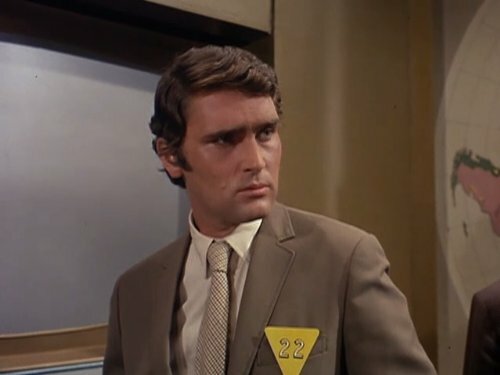 Robert Wolders in The Man From Thrush Affair, a fourth-season episode of The Man From U.N.C.L.E. Robert Wolders, an actor who was married to actress Merle Oberon and was the long-time companion to Audrey Hepburn, died last week at the age of 81, according to an obituary published by The Hollywood Reporter. His roles included playing a guest agent in The Man From U.N.C.L.E. episode The Man From Thrush Affair. The episode was filmed in the fall of 1967. In real life, the script was of the episode was revised so series co-star David McCallum could marry Kathy Carpenter and have a short honeymoon. In the final version, Solo (Robert Vaughn) and agent Andreas Petros (Wolders) infiltrate an island taken over by Thrush. The villainous organization has enslaved the island’s population and has built a device that can cause earthquakes around the world. Wolders also was a co-star for the second season of Laredo, a Western series that ran from 1965 to 1967. The series mixed comedy and drama, with Wolders playing Erik Hunter, a worldly addition to the Texas Rangers. In the 21st century, the notion of a television series coming to a definitive end seems old hat. But in the 1960s, that wasn’t the case. However, that changed when the 1963-67 series The Fugitive ended its run. The ABC series, produced by QM Productions, featured the exploits of Dr. Richard Kimble (David Janssen (1931-80), who had been convicted of killing his wife. 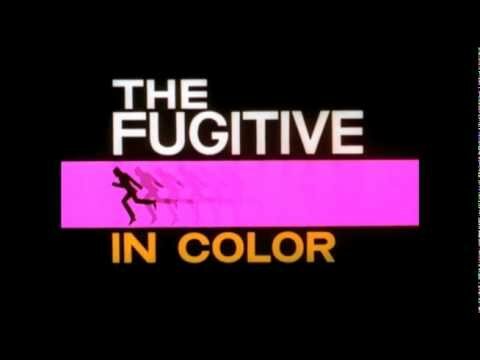 The Fugitive was one of the first examples of a series that was brought to an conclusive ending. Kimble, in the final two-part story, finally caught up with the “one-armed man” who killed his wife. For the early early years of QM Productions, the series was the company’s flagship show. It was the brainchild of veteran TV writer-producer Roy Huggins (1914-2002), who had earlier created the TV shows Maverick and 77 Sunset Strip. Higgins sold The Fugitive to ABC. The television network selected Quinn Martin to produce the show. At this point, Martin’s then-new company had sold one short-lived series, The New Breed. The Fugitive was QM’s first big hit. As the show was winding down, ABC and QM eventually elected to have the show actually end on its own terms. At the time, the practice was for a network to get as many episodes as it could from a show and simply end without a definitive conclusion. The Fugitive had an actually ending and more. When the final two-part story aired on ABC, it was one of the most-watched TV episodes of all time. At the time, it was a milestone. For Quinn Martin, there were more accomplishments to come. 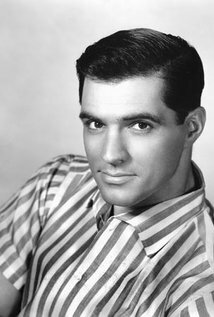 John Gavin, an actor and one-time U.S. ambassador to Mexico, has died at 86, TMZ reported. The American-born actor’s career began in the mid-1950s and lasted through the early 1980s. His most famous role, arguably, was Sam Loomis, the boyfriend of the doomed Marion Crane (Janet Leigh) in Alfred Hitchcock’s Psycho. Gavin also was signed to play James Bond in Diamonds Are Forever. The casting came at a time that Eon Productions was looking to Americanize 007. The production originally was to have been based at Universal Studios in Southern California. All that vaporized when United Artists executive David Picker insisted on making a run at getting the original film 007, Sean Connery, to return for a one-off. Connery agreed, receiving more than $1 million (which he donated to a trust he started). The Scotsman did the film and Gavin’s contract was paid off. Pinewood Studios in the U.K. was again the home base for a Bond film, although the project did extensive U.S. filming because much of the story was set in Las Vegas. Other notable Gavin film parts included Julius Caesar in Stanley Kubrick’s Spartacus; agent OSS 117 in OSS 117 Murder for Sale; and Midnight Lace. On television, he appeared on The Alfred Hitchcock Hour, Mannix and Kraft Suspense Theater. His acting career ended in 1981 when then-President (and former actor) Ronald Reagan named Gavin U.S. ambassador to Mexico. He resigned in 1986 to return to private life. The original Mustang driven by Steve McQueen in Bullitt, on display at Ford Motor Co.’s stand today at the North American International Auto Show. DETROIT — A car from the past was featured today at the North American International Auto Show, which normally introduces new models. The car was the Ford Mustang driven by Steve McQueen in 1968’s Bullitt. It was one of two Mustangs in the film. The other was a stunt car. However, the new car may have been upstaged a bit by the original car, which was brought out as part of the new model’s introduction. As part of the presentation, Ford used some of Lalo Schifrin’s score from the 1968 movie in a video promoting the new car. Also present was Molly McQueen, granddaughter of McQueen and Neile Adams. Molly McQueen was born seven years after the death of her grandfather. 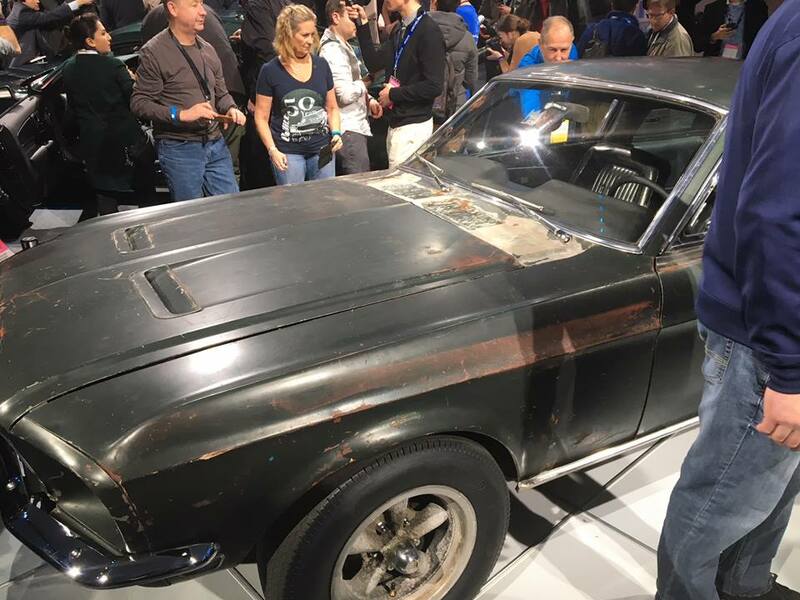 UPDATE (Jan. 15): Hagerty, which insures classic cars, said in an e-mailed statement today that the 1968 Mustang from Bullitt, if it comes to auction, could fetch a price similar to the $4.1 million for the James Bond Aston Martin DB5 in 2010 and the $4.6 million for original Batmobile in 2013. Baz Bamigboye, the Daily Mail scribe who has had a number of 007 scoops proven correct, put out a Bond 25 tweet but it’s hard to say how important it is or is not. Returning 007 actor Daniel Craig “is said to be ‘keen’ for” Denis Villeneuve to do direct the 25th 007 film, Bamigboye said in the post on Twitter. That’s all Bamigboye said. The tweet went out in the early evening New York time on Thursday. I thought he might be following up with a story later. But as of 11 p.m. New York time, no story had surfaced. Bamigboye has had a number of Bond scoops proven correct this decade. His most recent one was in March when he said that Neal Purvis and Robert Wade had been hired to write Bond 25. That was confirmed in a July announcement by Eon Productions and Metro-Goldwyn-Mayer that Bond 25 would have a release date of November 2019. Deadline: Hollywood said on July 26 there were three director front runners: Villeneuve, Yann Demange and David Mackenzie. Variety said the same day that Demange was the No. 1 front runner. Since then, not a peep about a Bond 25 director. For that matter, the movie at this point doesn’t have a distributor. Anyway, Villeneuve has a big movie, Blade Runner 2049, coming out this fall. He’s also committed to direct a remake of Dune. The latter project might limit Villeneuve’s availability for Bond 25. But who knows? Meanwhile, it’s unclear the importance of Bamigboye’s tweet. 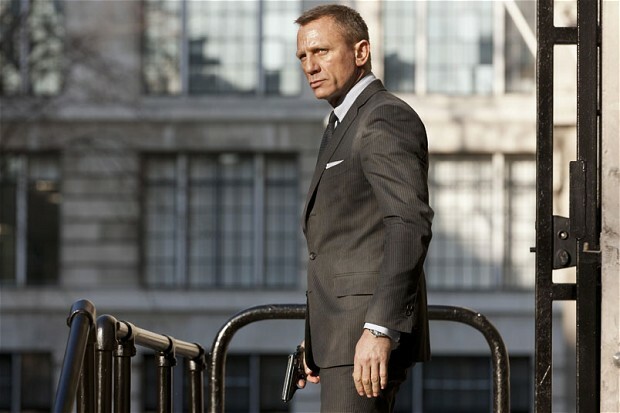 Eon boss Barbara Broccoli clearly wanted him back for a fifth 007 film. And Craig was given the title of co-producer for 2015’s SPECTRE. But, assuming Craig is indeed “keen” on Villeneuve, is there any more to it? Your guess is as good as the blog’s. Here’s the tweet if you want to see for yourself.